In all the time I was in Belle-Île-en-Mer (“Beautiful Island by the Sea”) off the coast of Brittany, I never stopped being awestruck by the fact that I had to walk over a moat and through the walls of a fortress to get to my hotel. It was one of the most unusual hotel experiences I’ve had to date. 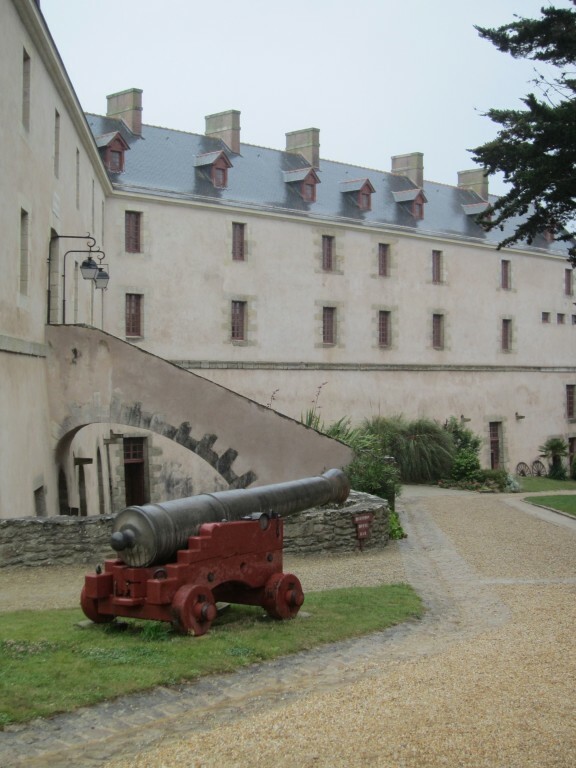 The Citadelle in Belle-Île-en-Mer was originally built in 1549, during the reign of Louis XIV, and then, in 1683, noted fortification designer, Sebastien de Vauban Prestre, came to stay and left his mark on the blueprint. In the 17th century, the Citadelle kept the island safe from pirates and the Spanish, and was overtaken by the English in the Seven Years’ War. In the 18th and 19th century it held prisoners. I wonder if these carvings in a wall were done by prisoners. In World War I, German officers were imprisoned in the fortress…then it was occupied by German troops in World War II. Now it holds a museum, a restaurant, and a hotel, but large parts of it seem simply like an ancient abandoned fort. The fortress sits on the edge of the Atlantic, still standing strong even after being battered by the sea for centuries. The entrance to the hotel is tucked into a corner and there’s no sign, which adds to the feeling of being somewhere you’re not supposed to be. Inside the hotel, the lobby and hallways retain the authenticity of the structure with subtle lighting and military artifacts. The room is simply furnished, and overlooks the sea. I loved the oversized chaise by the window. The large primitive door with its ancient hardware was original. Miniature tin soldiers on horseback are framed as artwork. Judging by his persistence, I assume that the last tenant of room 203 had been feeding this sea gull. He would not leave me alone, causing me to not only start talking to him, but to lean out the window and watch all the sea gull goings-on. This hotel was truly a larger-than-life location, and added an element of wonderment to an unforgettable adventure. Walk down the path from the Citadelle to this cozy pink pub/restaurant on the harbor. In a welcoming, low-ceilinged room, the lively staff takes orders and converses with the guests. The chef comes out to cook fresh fish in the fireplace that is in the center of the room. Enormous loaves of the most delicious bread sit on a sideboard, waiting to be cut into thick slices and served in linen-lined baskets. Make a reservation or get there early, because it’s always packed. It was so good, I ate there twice. This hotel looks amazing, if not a little creepy. Glad you enjoyed yourself though. Oh my gosh! I don’t recall seeing this before! What an AMAZING historical building and idea for a hotel! WOW!